Start your review of Chad Bu-Mansour. Send a message to Chad Bu-Mansour. Thank You! Your message has been sent to Chad Bu-Mansour at Peel Chrysler Jeep Dodge RAM. Thanks Patience for the great sales service. Everything was quick and efficient! Great place to buy. Love the Ram Limited! Top dollar for my trade in too!! Thanks again! Great pricing, seamless experience, was easy to complete the transaction. Will buy again from Peel when I purchase my next jeep in the next little while. "Great service easy to deal with and patient!" Great service easy to deal with and patient! 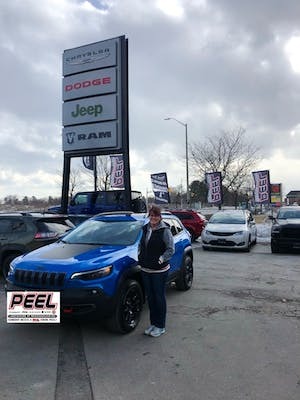 I was looking for a pick up truck since December 2018, met with Chad from peel Chrysler and gave him an idea of options required. He found just what I was looking for...Came through with flying colors, and got a great deal to boot! I found Chad and Bruno to be knowledgeable and helpful professionals. My expectations were exceeded. Rather than trying to sell me a vehicle,these individuals listened and guided both the dealership and myself in the correct direction in order that a FAIR deal was finalized. Just picked up my third Ram in less than four years from Peel Chrysler. 0% financing from Dave in the finance office every time. Every other dealer quoted me almost 5%. Can't beat the deals at Peel! These guys by far have the best customer service I've ever experienced from a dealership. New or used. Went in just to look at a vehicle I saw online and ended up doing a deal with Chad and trading mine in. For once I actually felt like a sales rep was in my corner! Thanks Chad! I was referred to Chad from a friend of mine. I was hesitant because Chad was a little to easy to talk to. The whole process actually was easy. Hubby and I went down on a Saturday, crazy busy day.....but Chad and Shaf were like a well oiled machine. They were flawless. Extremely friendly and made us feel very comfortable. Chad and Shaf both worked very hard to get us the price we wanted. The prices were way less then they were around my town. I absolutely LOVE my new Jeep, if you have any questions....they have answers for you. They will make sure all your questions are answered and that you are happy before you sign anything!! Go see Chad before you buy anywhere else. Thank you Chad and Shaf!! It was an absolute pleasure to work with you.